Tampa Bay Rays pitcher Jake Faria throws during the first official workout for pitchers and catchers on Wednesday at Charlotte Sports Park. Tampa Bay Rays pitcher Jake Faria talks with teammates before the first official workout for pitchers and catchers. 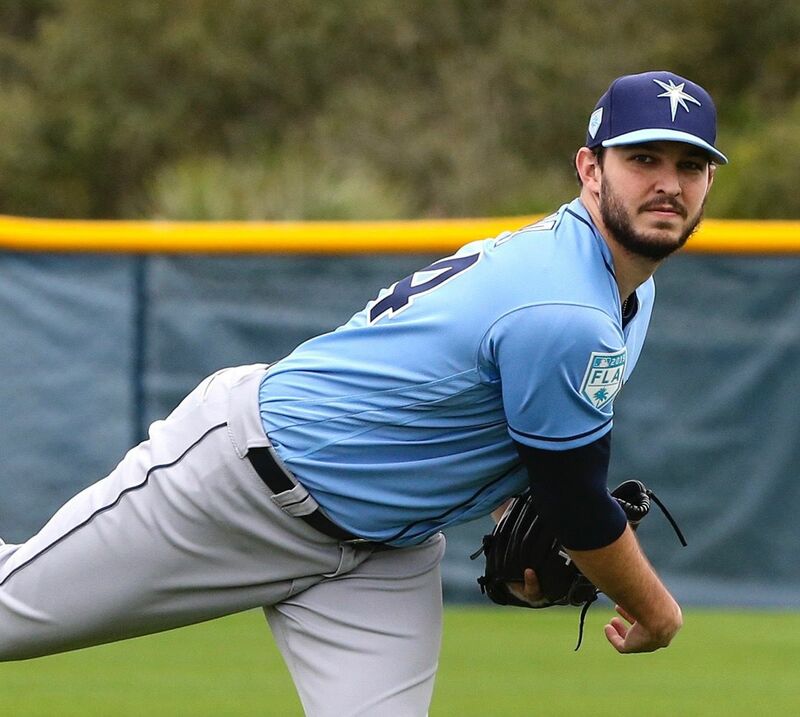 There is plenty about 2018 that Tampa Bay Rays pitcher Jake Faria would like to leave behind him. He battled with injuries and inconsistencies, which derailed what he hoped to be a promising sophomore campaign. As pitchers and catchers reported to Charlotte Sports Park for the first official workout on Wednesday, he was optimistic about how he could recover from the down year. “After last year, people kind of look at it like 2017 and every year before that was a fluke,” Faria said. “Last year was my first real bad season and I wouldn’t even say it was all that terrible. But when you get off to the start that I had gotten off to with the terrible game in Boston, you know you’re gonna be a little bit deflated. Faria’s season began as a starter, going 4-4 in 12 starts, but it ended in a reliever role after injury. 2018 saw his ERA rise from 3.43 in his rookie season to 5.40 last year. Pair that with a drop from 8.7 to 6.9 in strikeouts per nine innings, it seemed as if Faria was off for much of the year. Faria’s first blunder came in an April game against the Red Sox where he gave up eight runs in 1 2/3 innings. Then in mid-may he suffered an oblique strain, which landed him on the 60-day disabled list. So how does he plan to shake off last year’s woes? It starts with his weight loss and taking better care of his body. The 6-foot-4 right hander dropped 16 pounds and nearly 10 percent body fat from last spring and says he feels much better heading into camp. He’s also watched his Cy-Young-winning teammate Blake Snell, who became a model of consistency last year with 21 wins and a 1.89 ERA. Their relationship has helped to shape Faria’s comeback, if you want to call it one. What happens to Snell often follows suit with Faria, but he’s not ready to crown himself the 2019 Cy Young winner just yet. “Me and Blake have been pretty close for a while so I’ve always watched how he’s gone about things,” Faria said. Snell was also a groomsmen at Faria’s wedding last year. Though he didn’t show up for the rehearsal dinner, he made it to the wedding. Faria said he didn’t screw anything up. “It was awesome, had a lot of fun,” Faria said. Your one-stop shop for all things Tampa Bay Rays spring training.